ST. CLAIR SHORES, Mich.- Ford Motor Company released the 2013 Ford Atlas Concept Truck earlier this year in Detroit, making some impressive technological advances with the Concept Truck! The Atlas is one Ford's first steps towards refining and adding high-speed technological upgrades to their line of pickup trucks. The Ford Atlas features major technological advancements like the Intelligent Assess system, which automatically unlocks the truck's doors and tailgate when the owner is within a certain distance of the truck. The Ford concept truck also features a 360 degree camera and Dynamic Hitch Assist, which uses a camera to help you align the ball and hitch. Now that Ford Motor Company has made these impressive technological advances, we are excited to see what happens next! 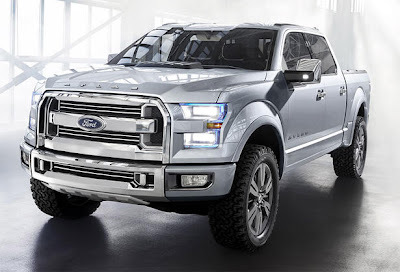 The Ford Atlas is features a twin-turbo, EcoBoost 3.5 liter V-6 engine and is equipped with a fuel-saving transmission. The Atlas also has other fuel-saving features like the active grille shutters and a drop-down front air dam which both cut down on air resistance, saving you money on gas. While the major technological advancements of the Ford Atlas Concept Truck are not on the market yet, you can download the 2013 Ford F-150 Brochure and save on a new Ford truck with our Ford F-150 Rebates! Family owned and operated since 1946, Roy O'Brien Ford is located at 22201 E. 9 Mile Rd. St. Clair Shores, MI 48080 for all your Metro Detroit Ford Vehicle needs. Stay on the right track to Nine Mile and Mack!